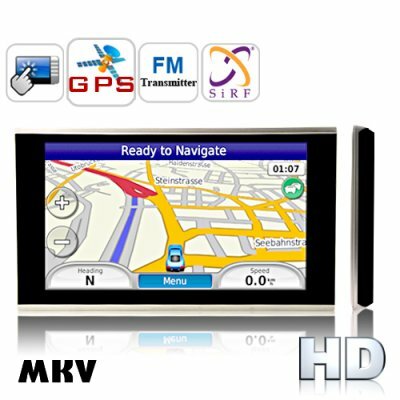 Successfully Added 6.2 Inch HD Touch Screen GPS Navigator (Direct WIN CE Access) to your Shopping Cart. A handheld portable GPS navigation device that utilizes the lightning fast Atlas IV chip, 2GB flash memory, and the WIN CE 6.0 operating system for awesome power and performance - together with its 800 x 480 resolution iPhone-style slide touch screen AND direct access to the Windows operating system so you can add programs and applications - this is the GPS navigator of the decade! Hardware: This GPS Navigator makes other GPS Navigators look like compasses! It uses the SiRF Atlas IV chip for unprecedented performance and speed. SiRF is the biggest maker of handheld device CPU's on the market today, and their Atlas IV chip is a champion in every sense of the word. If this baby were a car, it would have 1,000 horsepower! Together with 4GB flash memory, a free 2GB TF microSD card, and a high definition iPod type sliding touchscreen - this baby makes the perfect handheld or in-car navigation device! Software: Powerful CPU and DDR RAM running the WIN CE 6.0 operating system lets this 6.2 GPS Navigator deliver a truly impressive GPS and multimedia experience. Run the latest GPS maps and have access to the latest map features like Lane Assist, Voice Guidance, 3-D Views, Intelligent Route Planning, and Points Of Interest (POI). Better yet, since it runs the Windows CE 6.0, the built-in media player lets you play MKV, AVI, DIVX5, and XVID movie files. It also runs AAC, MP3, and even OGG audio files. Still better yet, this incredible GPS device gives you direct access to the operating system so you can add programs and run computer files just as you would on a PDA! Simply Amazing! : Intuitive menus where you can drag and slide the items up and down, instant response interface, and a 6.2 inch screen that features 800 x 480 pixel resolution - like watching a 60 inch Plasma TV in the palms of your hands - what are waiting for?! Be smart and add to cart - right away! From the GPS navigator specialists - Chinavasion. MKV, AVI, XVID, AAC, OGG, MP3!! Viable car DVD player alternative in that it has GPS, multimedia functionality, and FM transmitter. Car mounting kit included free. You don't have to pay to use GPS. The satellites which transmit GPS coordinates are maintained by the US government. You just need a GPS receiver to take advantage of the data. The CVGY-TR07 contains a top of the line GPS receiver. on 2010-11-29 05:37:40 nice item, delivery very fast!!!! this gps is very nice!!! I took the gps this and I worked him in the car, they is perfect with city good maps. and banner from all has 45 maps. gps they is perfect. any it wants gps I propose this. Bene Chinavasion ottima anche la velocità di consegna in 4 giorni lavorativi.